A recipe for beef soup- what could be so hard about that, right? Well, if you’ve never cooked with beef shanks before and you don’t realize just how long it takes for them to break down and be edible, you might think that the recipe’s 90-minute suggested cooking time was reasonable, and might try to attempt making it after work one night. If you did, you would find that it actually required at least a few hours of simmering to reach the right consistency (this was discovered over the course of three days, in which I would cook it for a while each night and stick it back in the fridge before going to bed because it STILL wasn’t done). It wasn’t a huge tragedy, and eventually I got my soup done and it was delicious, but if I ever cook with beef shanks again I think I would consider going the slow cooker route and putting them in before work. But enough about the beef, some of you are probably saying “What is this ‘freekeh’ of which you speak?” Long story short, it’s a form of wheat that has been roasted and has a wonderful smoky flavor. (You can read more about it in this post.) I had never cooked with it before and my blogger friend Warda had mentioned using it in soup, so when I saw this recipe, with its warming flavors of cardamom, cinnamon and allspice, I was attracted to it instantly. However, if these flavors don’t appeal to you, I think freekeh would be excellent substituted for barley in any mushroom, beef, or lamb-barley soup. In spite of my issues with the recipe (which I have modified slightly in hopes of sparing you the aggravation I experienced!) the soup turned out to be a winner. Marvin, who isn’t the hugest soup fan, gave it two thumbs up. If anyone has slow cooker experience and can suggest how to adapt it, let me know- I think it would work well. There are two types of freekeh, crushed and whole. You can use either one; the whole freekeh will just take a little longer to cook. The freekeh I bought came packaged and I did not see any stones, but if you buy it in bulk you should sort through it like you would with lentils. The original recipe called for simmering the beef shanks for a total of about 1 1/2 hours. I needed to simmer mine much longer before I was able to separate the meat into pieces, and even then, it was tough (har har). I had never worked with beef shanks before and did not realize how cartilaginous they are! Just be patient, though, and you will be rewarded. I’m not exactly sure why the recipe calls for ground cardamom AND cardamom pods. If you only have it ground and don’t want to buy the pods, I would think you could just add an additional 1/4 tsp or so. Put the 10 cups water on to boil while you gather the rest of your ingredients and chop your onions (if you have an electric tea kettle, this is a great use for it). Wash and pat dry the beef shanks; give them a generous coat of salt and black pepper on both sides. Set aside. In a Dutch oven or other large, heavy-bottomed pot, heat the oil over medium heat. Add the onion and sauté until it begins to soften. Add the beef shanks and spices and stir well to coat the beef, about 3 minutes. Add the boiling water, cover the pot, and return to the boil. Skim the foam from the surface of the soup. Reduce heat and simmer gently, covered. After 2 hours or so, you can check the meat every 30 minutes by poking it with a fork. When it’s nearly falling apart, remove it from the soup. Cover the soup and turn the burner off or on the lowest setting. When the meat is cool enough to handle, pull it from the bone, tearing it into bite-sized chunks and discarding any gristly pieces. (If the meat does not pull apart easily, return it to the soup and cook it longer.) Return the pieces of meat to the soup pot. At this point, you can add the freekeh, or you can do what I did, which was to refrigerate the soup overnight so as to skim the fat from the surface. Either way, return the soup to a simmer and add the freekeh along with 1 Tbs salt. 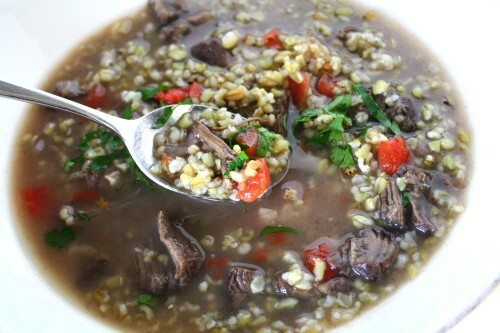 If using crushed freekeh it will cook almost instantly, like bulghur. If using whole freekeh, simmer for 30-45 minutes. The freekeh should retain a slight crunch when you bite into it, like biting into a kernel of corn. If you are using tomatoes you can add them at this point. Taste the soup for salt and pepper, adding more if needed. 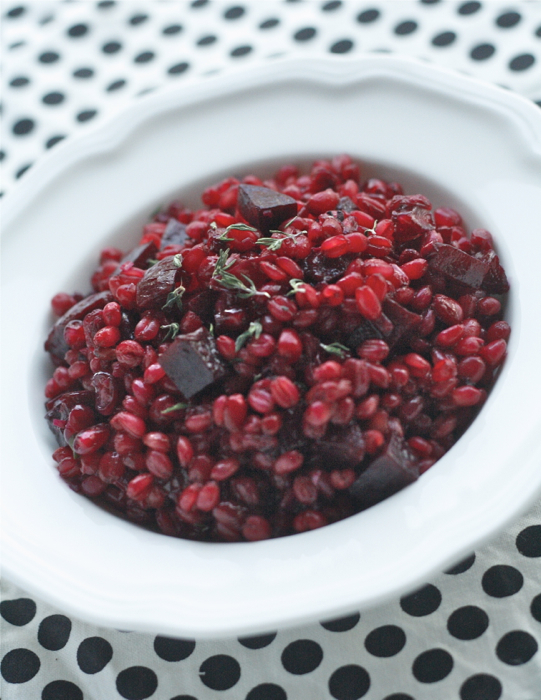 Serve with wedges of lemon and fresh chopped parsley. Things are crazy lately and I haven’t been able to post full-on recipes as regularly as I would like, so I had the idea to do some shorter posts focusing on single ingredients that you may or may not be familiar with. First up: freekeh- also spelled farik, frik, freka, and probably a handful of other ways depending on who you ask. The reason this ingredient doesn’t have an established anglicized spelling is because it is fairly uncommon in the U.S. (although a pre-cooked version has recently made an appearance on the shelves at Trader Joe’s). So what exactly is freekeh? According to May S. Bsisu in her book The Arab Table, it is “…the roasted grains of green wheat stalks. There are two types: whole green kernels and shelled kernels. Whole green freka can be purchased in Middle Eastern stores… As with bulgur, freka should be soaked in cold water for 10 minutes before cooking…” The Wikipedia entry on freekeh gives more detailed information as to how it’s produced. (Personally though, I love the succinct description on the package I bought: “Roasted Baby Wheat”- sounds a bit diabolical!) The freekeh I purchased was the cracked or “shelled” variety, and it cooked up very quickly. I think if you were using whole freekeh it would take 2-3 x as long. Roasting gives freekeh a delightfully smoky flavor, which makes it really stand out in comparison to its cousin, bulghur. If you enjoy smoked foods, you’ll really like freekeh- its scent reminds me of campfires and fall. You can use it in soup, or cook it on its own as a side dish. According to Bsisu, the finished texture should have a slight crunch or “pop” to it, like when you bite into sweet corn. As you can see in the photo below, since it is not fully mature, freekeh has a slight greenish tint to it. I first heard about this grain a few months ago from Warda of 64 Sq Ft Kitchen. It’s a pretty obscure item, at least around here- I’ve shopped at several grocery stores specializing in Mid-East foods and had never seen or heard of it. I finally came across some when the band took a trip out to Grand Rapids and we stopped to get sandwiches in a small Middle Eastern deli/grocery (The Pita House). (Update: I have since found packaged whole freekeh at Gabriel Imports in the Eastern Market.) Once I found the freekeh, though, I still had trouble finding recipes- I looked in several Middle Eastern cookbooks and found only two or three mentions. * I’m guessing this is because it’s more common in Palestine, Jordan and Syria, whereas many Middle Eastern cookbooks published for Westerners tend to focus on foods from Lebanon, Turkey, or Morocco. 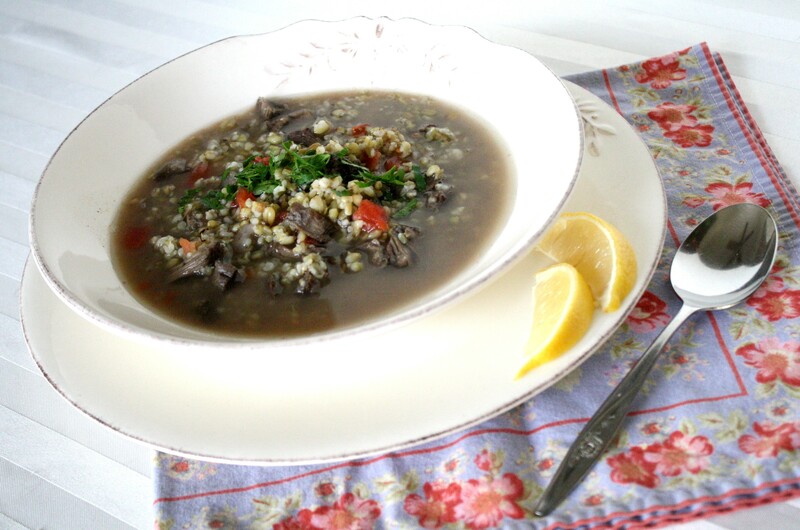 I did find a recipe for Beef & Freekeh Soup (Shorbat Freka) in The Arab Table, which I will post about very soon posted about here! *Note: I have since come across this website, which offers off-the-beaten-track recipes such as “Freekeh Yogurt and Zucchini Loaf” and “Crisp Freekeh Crab Cakes with Aioli”. If anyone is brave, you can try them and let me know how they turn out. I recently finished reading Russ Parsons’ How to Pick a Peach for our first book club discussion, and thought it would be fitting to cook a couple of his recipes to enhance the experience. Since the book is sectioned by season, I flipped through the “Spring” recipes for ideas. Right off the bat there was a recipe that appealed to me in the Onions chapter for a grilled cheese with onions. Like me, I’m sure most of you don’t need a recipe for grilled cheese; for me the recipe was more a reminder of how great a simple combo like cheese and onions can be. He dresses it up a bit by using a fancy cheese, and dressing the onions in a little champagne vinegar and parsley. The other recipe I chose, Asparagus-Shrimp risotto, was dictated by the fact that asparagus is just about the only seasonal Michigan produce you can get in the farmers’ markets right now (with the exception of rhubarb, which was not in the book). Parsons’ grilled cheese is meant to be cut into strips and served as an appetizer with wine or (as he suggests) Champagne. Don’t get me wrong, I’m not one to eschew an opportunity to drink Champagne, but the only chance I had to make this was at lunch, alone, and seeing as how I had other chores to do that day, the Champagne was not an option. Anyhow, the basics are: white bread with the crusts trimmed (I left mine on), very thinly sliced sweet onions (Vidalia, Walla Walla, whatever) marinated in a splash of Champagne vinegar (I used white wine vinegar), chopped parsley, and some soft cheese (he suggests Taleggio, Brie or Taleme; I used Fontina). Something I learned from the book is that sweet onions aren’t any “sweeter” than cooking onions; they just contain much less of the sulfurous compound that makes onions taste oniony. It’s really kind of pointless to even cook with them, since what little onion flavor they have dissipates with cooking. My Vidalias were so mild that I put an entire 1/2 onion on my sandwich and for my taste, it still could have used more onion flavor. I was also a little disappointed in the Fontina; despite the fancy Euro name, it tasted almost exactly like Monterey Jack (but of course cost more). I think a slightly more assertive cheese would be my preference if I made this again. Either that, or I’d put a little Dijon mustard on it. I also added a sprinkle of salt and pepper to my onions before putting them on the sandwich. With a green salad, it was a simple but satisfying lunch, if not altogether nutritious. You probably know the drill with making risotto, but to sum up the recipe: 2 cups arborio rice, 1 1/4 lb asparagus (skinny works well for this recipe), 1/4 lb shrimp (or more), 1 onion, 9 cups H2O, 1/2 c dry white wine, 4 tbs butter, a few tbs Parmigiano. Trim the asparagus, reserve the tips and cut the stems into 1/3-inch rounds. Dice the onion and shell the shrimp; put the trimmings from the above ingredients into a stockpot with the water and simmer for at least 30 minutes. Melt 3 tbs butter in a large skillet and add the asparagus stems and onion and cook until onion begins to soften; add 2 cups arborio rice and cook another 5 min or so. Add wine and cook until evaporated. Start adding the hot stock, about 3 ladles’ worth at a time, ladling it through a strainer, stirring as it cooks down, repeating the process as the stock gets absorbed. Before the final addition of stock, add the raw shrimp and asparagus tips. I like to cut each shrimp into 3 or 4 pieces, so that it’s more evenly distributed through the risotto, but also so it cooks in the same time as the asparagus tips. Since the stock is unsalted, you’ll need to add a fair amount of salt, which you can do at this stage. According to Parsons, your result should be fairly soupy (it does tend to thicken up a bit as it sits). Add the final tbs butter and the cheese, and enjoy with a green salad (I made a lemon-Dijon- Parmigiano vinaigrette) and a crisp glass of white. Ah, risotto… is there anything more comforting than a big plate of warm, creamy, starchy goodness? The other night I was craving risotto and knew I wanted to include some shrimp and scallops that had been hanging around the freezer, but I wanted to take it to the next level and try something a little different. Typical me, I had bought some saffron several months ago without any specific recipe in mind, and it has sat on my spice shelf ever since, making me feel guilty. Now was the time to delve into that precious little vial! (I have since come to the realization that spices as an impulse purchase, even with the best of intentions, is not such a smart idea.) I consulted the Flavor Bible to see what other flavors might be viable- I wanted to compliment the saffron, not compete or cover it up. I was thinking something citrus, and finally settled on citrus zest with the notion that straight-up lemon juice would be too aggressive. My risotto was just right: the mineral tones of the saffron and the bright citrus zest perked up the dish and kept it from being too heavy on the palate. And since it was a seafood risotto, I didn’t use any cream or cheese (and only a small amount of butter). Hey, I’m not saying it’s diet food, but as risotto goes, it’s lighter than most. Oh, and as a side dish, I made some sautéed spinach with garlic, lemon and pinenuts. I do need a little something green on my plate if I’m going to eat all those carbs! Notes: I used a combination of chicken stock and water, since I wanted to add some flavor but didn’t want it to taste overly chicken-y. A good option if you’re using shrimp is to peel the raw shrimp and simmer the shells in a bit of lightly salted water to make a quick stock (strain before using). For the citrus zest, a Microplane is the best option, but if you don’t have one, use a zester and then mince the zest. I really loved the combination of all three types of citrus zest, but feel free to just use one or two, or to substitute different types of citrus (with the exception of lime, which I think would be too bitter). Directions: Put the stock and saffron in a saucepan and turn the heat to medium; when it reaches a simmer, turn it to low. Put 2 tbs butter in a medium sized heavy-bottomed saucepan or stock pot over medium heat. When it’s hot, add the shallot and celery and cook for 3-5 minutes or until the onions soften. Add the rice and cook for another 2 or 3 minutes, stirring occasionally. Add a little salt and white pepper, and the wine. Stir and let the liquid bubble away. Continue cooking over medium heat. Add 1/2 cup of the warmed stock. When the stock is nearly evaporated, add the next 1/2 cup, continuing the process until the rice is fully cooked. The mixture should be neither soupy nor dry. Stir frequently, making sure the rice is not sticking to the bottom of the pan. Meanwhile, heat 2 tbs butter in a skillet for the seafood. If you’re using both scallops and shrimp, give the shrimp a head start of 2-3 minutes before adding the scallops to the pan. Cook gently until opaque, taking care not to overcook. Begin tasting the rice after about 20 minutes of cooking. You want it to be creamy but still a tiny bit “al dente”. This could take up to 30 minutes or more. When it reaches this stage, stir in the seafood and its pan juces along with the citrus zest, and stir. If you want to take it over the top, add an additional 2 tbs butter. Taste for salt, and serve.